Not to be confused with Bowser Pop. 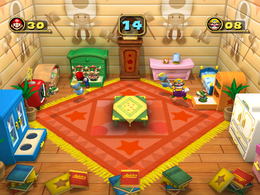 Bowser Bop is a Story Minigame in Mario Party 4. Only two players compete in this minigame. In the story mode, the player would have to face off against Toad in order to win his present. A clock is shown ticking, then it bongs. The scene zooms out to reveal the two players in front of a table with mallets. They each pick a mallet up, and the game begins. The goal of the game is to get the most points by hitting the Koopa Kid and Bowser heads that pop out of the furniture. Koopa Kid heads are worth one point and Bowser heads are worth two points. The total amount of time given is 60 seconds. The players' mallets will disappear, and the winning player celebrates while the other player slumps in disappointment. Toad – "In this game, you must bop all of the Bowsers that pop out. Use to bop with the hammer. Each Koopa Kid is 1 point, and Bowser is 2 points. If you can get more points than I can in sixty seconds, then you are the winner!" This and the end of Mini-Game Island from the original Mario Party are the only times in the entire Mario series where Toad is the boss (as a non-player character). This page was last edited on May 22, 2017, at 04:00.